Prime Minister Theresa May presented herself as a stable leader to take Britain through Brexit, but her gamble of an election backfired spectacularly. Theresa May's campaign revolved around her leadership qualities and ability to implement Brexit. London: Prime Minister Theresa May presented herself as a stable leader to take Britain through Brexit, but her gamble of an election backfired spectacularly. 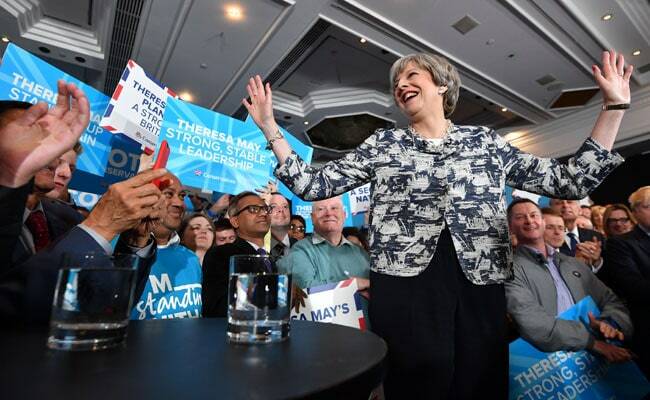 The ruling Conservatives lost their parliamentary majority in Thursday's vote, after a campaign marred by terror attacks, policy mistakes and her own awkward public manner, prompting warnings that her days are numbered. "It is clear that this election has left her authority deeply wounded, perhaps fatally," said Paul Goodman, a former lawmaker and editor of the ConservativeHome website. "She ran a pretty dreadful campaign," added Conservative lawmaker Anna Soubry as the results rolled in, saying she should "consider her position". May stunned the country when she called the election in April, after repeatedly arguing that such a poll would be too disruptive following the referendum vote to leave the European Union last year. At the time, the Conservatives were riding high in the polls, and it initially seemed like a smart move -- until the opposition Labour party began to gain ground. May began with a presidential-style campaign focused around her own leadership qualities and her ability to implement Brexit, an issue on which Labour was divided. But she drew accusations of being robotic, over-reliant on slogans and soundbites, and so awkward around members of the public that she even boycotted television debates. A bold plan to change the way elderly social care is funded had to be hastily amended after a backlash among older, mostly Conservative-backing voters, undermining her reputation for competence. And the terror attacks in London and Manchester shone a light on May's record during six years as interior minister came under scrutiny, particularly whether cuts to police numbers could be blamed for the failure to stop the assailants. When May replaced David Cameron after the Brexit vote last year, she presented herself as a steady hand on the tiller as Britain headed into unchartered waters. She was the hard-working vicar's daughter who eschewed gossip and focused on "getting the job done", with her flamboyant shoes the only sign of rebellion. During the campaign, she stepped up her rhetoric against the EU, using a description of herself as a "bloody difficult woman" to insist she would be tough in Brexit talks. But her promise to offer "strong and stable leadership" was undermined by the U-turn on social care -- and her own broken promise not to call the election in the first place. Like Cameron, who called the EU referendum in the mistaken confidence that he would win the vote to stay in the bloc, she now risks being remembered for hubris. "It was a self-inflicted error, a self-inflicted wound and it was something that was likely born out of a bit of taking the British public for granted," Brian Klaas of the London School of Economics (LSE) told AFP. Some commentators have drawn comparisons with US presidential candidate Hillary Clinton, who lost out to the unexpected opposition of Donald Trump. "It's almost as if Theresa May looked at Hillary's campaign and said: 'Let's do that'," wrote a Financial Times journalist, Robert Shrimsley, on Twitter. The care row highlighted May's habit of relying on a few trusted advisors, which saw even cabinet ministers excluded from discussion of the controversial policy. A reshuffle was always expected after the election, but senior Conservatives are now likely to push for changes to her inner circle -- as well as greater say over policy. As Britain's second female prime minister, May is often compared to the first, Conservative "Iron Lady" Margaret Thatcher, but struck a markedly different tone, rejecting "untrammelled free markets" and "the cult of selfish individualism". She had already challenged the party's direction, famously warning as Conservative chairwoman in 2002 that the Tories were seen as "the nasty party". May earned a reputation as a dogged minister when leading the interior ministry under David Cameron, but never gained acceptance among the prime minister's cosmopolitan inner circle. However, being in the shadows helped her avoid the flack from Britain's vote to leave the European Union, despite backing Remain. Presenting herself as committed to implementing the public's decision, May was able to win support from both factions and swept to the party's leadership. May's astute political instincts served her well during the day-to-day business of leading the country. But the spotlight of an election campaign exposed her awkward public manner to the country at large, which gave its damning verdict on Thursday.